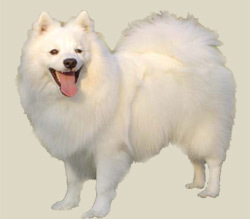 The long-haired coat of the Japanese Spitz has a thick under-layer that is always pure white. The tail is covered with long hair and is carried curled over the back. The coat is short on the bottom half of the legs, with breeches on the hind legs and feathering on the forelegs. The ears are small and pointed upright, and the muzzle tapers slightly. The large oval eyes are dark and slightly slanted, and the nose and lips are black. The face of the Japanese Spitz is wedge-shaped. There is dense feathering on the feet. Most Japanese Spitz are good watch dogs, as they have a tendency to bark a lot, especially to warn off arriving strangers. The Japanese Spitz is first and foremost a companion dog and thrives on human contact and attention, preferring to be a member of the family. They are intelligent, playful, alert, and obedient, excellent with children. Exercise should be given priority when caring for this type of dog because of its natural outdoor enthusiasm. Japanese spitzes would love daily long walks with their masters; it not only improves their physical being, but also establishes the bond between both individuals. Giving them the chance to sprint a wide and secure area once in a while is also a good idea. Obedience training is also advisable to be performed at a young age because it gives them verbal sensitivity, discipline and adequate sociability to other dogs, persons and adaptability to places.